Should You Pay for Your Child's College Education? 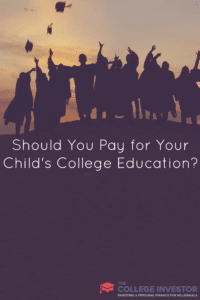 Home » Should You Pay for Your Child’s College Education? I celebrated my first Father’s Day this past weekend. I had a great day celebrating with my family, but the entire day I was stuck thinking about the future and how my life has changed. Am I providing well enough for my family? Am I preparing well enough for the future? Are we saving enough for my daughter’s college education? This is a difficult question that many parents wrestle with, and unfortunately, there is no clear-cut answer. The “Ultimate Parenting Guide” does not have an answer to this question (nor does it exist, because if it did I would love to know how to get your child to sleep through the night before they are six months old . . . ). From working in higher education finance on a college campus I can tell you that a majority of parents believe it is their responsibility to pay for their child’s college education. Many parents will do whatever needs to be done financially to get their child a degree. They often overlook the financial harm/ruin they are putting themselves through. 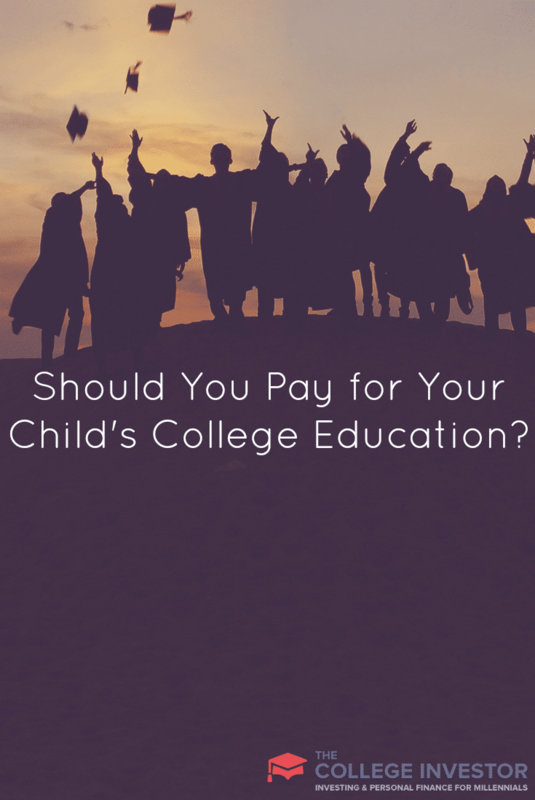 My answer to the question is this: If you decide to fund your child’s college education you should only do so after you have a solid financial footing yourself. I would not ever put yourself through financial ruin just to send your child to college. Don’t feel obligated. Here is why . . . .
You have probably heard of Dave Ramsey’s baby steps — his seven-step plan to becoming financially stable and providing well for your future. Saving for your child’s education is baby step #5. First you should save at least $1,000 in an emergency fund, then pay off all mortgage-related debts, then save three to six months’ worth of expenses, then invest 15% of your income, then you can begin saving for college. By completed all four of the initial steps you have secured a solid financial foothold and are able to provide for yourself financially before supporting your child through college. I highly recommend this as well, simply because paying for your child’s tuition and fees are not the only expenses that you will have during their college years. What if their car breaks down? Will you be able to help them repair it? Will you be able to help them pay for travel expenses so they can come home for holidays? Can you buy them a yearbook? What about a class ring? What about a graduation gift? What about your other children? If you place yourself into a precarious financial position by putting one child through college what will you do when your other children come along? Do they get the short end of the stick because they are not the firstborn? Many parents would never intentionally make this distinction but by putting all of their resources toward one child’s college education they may leave themselves in a difficult situation when child numeral two comes along. Saving for a child’s college education is much different than paying for your child’s college education. Let me explain. Investing money month after month into a 529 college savings plan is much different than taking out a private student loan each semester to pay their fees. Making a plan years ahead of time to take advantage of compound interest will give you the best benefit for your efforts. I agree with Dave Ramsey to a certain point. I think it would be OK to begin investing a small monthly amount into a 529 plan for your children each month, even if you have other small debts and are not investing 15% of your income. As long as you are able to pay all of your debts each month, you have a budget, you are investing some portion of your income, and you have a positive cash flow, I see no harm in making the decision to put that extra money toward saving for your child’s college education. I think you will see much more of a benefit from investing into a 529 over many years, than in taking out a student loan and then spending the next 10 to 30 years repaying it. There are not many things more sad than a parent being unable to retire because they are stuck repaying their child’s student loans! At it’s core, this is a personal decision. There is no black and white answer. However, I would strongly caution you against paying for your child’s college education if you cannot make ends meet yourself. A college education is not a requirement for every child, nor are parents expected to pay for it. Do not feel obligated. If you feel the need to pay for it, then you should make sure your own finances are in order, then begin saving in a 529 college savings plan each month. What are your thoughts on paying for your child’s college education? As someone who spends a great deal of time working with student loans, I think the best thing a parent can do for their child is to educate them on every facet of the subject. All students should understand how interest compounds. All students should know exactly how much they will have to pay each month on their loans. In my experience, college students have no idea what they are getting themselves into. Funding an education is great, but teaching them valuable finance lessons BEFORE they make a huge mistake is the best thing a parent can do for their child. These lessons apply far beyond college and can help prevent a lot of stress once they are on their own. @Michael – I could not have said it better myself. Student don’t understand how loans work and land themselves in financial trouble before they even graduate. One of the best gifts you can pass on to your child is knowledge! Let me tell you why saving for your kids’ college education can save you $. We saved for our kids’ college even when we were broke – just a little at a time – over years. That forced us to live “below our means” for years. Now it’s just a habit and we don’t feel deprived. I’m so glad we did ’cause it’s great to see how far ahead of the money game that put them when they graduated with no debt. It also taught them to live frugally. You can certainly set an example for your child by the way you live. Living below your means is incredibly important and it sounds like you made the best decision for you and your family. Thanks for sharing! @Dennis – It sounds like you have a great plan already, and congrats on your first Father’s Day! I completely agree with you that happiness for many people does not reside after earning a college degree. Many people would be much better served in learning real life skills and not pursuing higher ed. Sounds like an excellent plan to me. I agree that many students would be better off being actually invested in their own education. I would prefer working during school to taking out a student loan, but if the loans are minimal, it would likely be worth it! Love your perspective on this DJ. The biggest thing that stood out to me that I completely agree with is that parents shouldn’t feel obligated to pay for their kid’s college tuition. I had to pay my own and didn’t even think of the possibility of asking my parents to pay for it. Like you said, if you’re in a financial position to be able to do it without ruining your own well-being it’s a great gesture. But it’s definitely not a necessity.